Thy next foe is... Paradise floats upon the lake... A silent being wields thunder... A moving bridge to cross to higher ground. 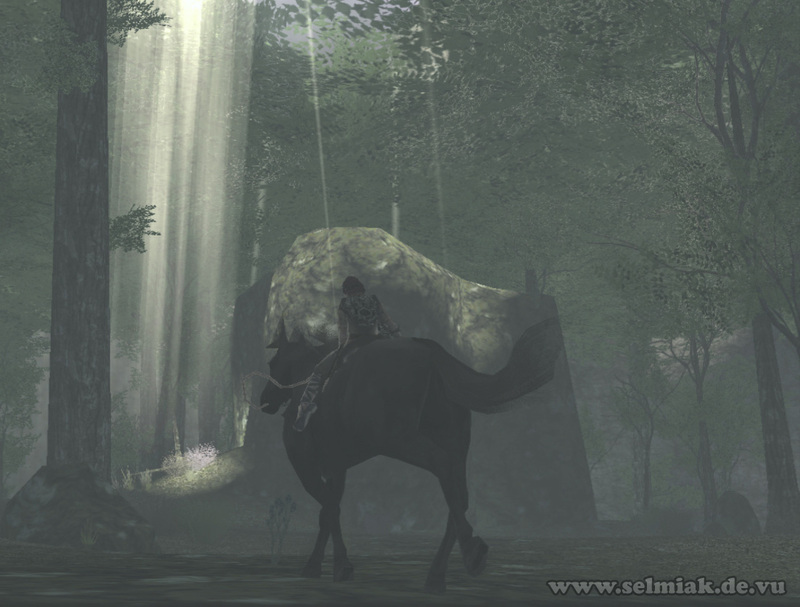 Again step out of the temple and ride on the eastern side of the temple to the northeastern end of the mountain plateau you and the temple are on, and of course you ride over the natural rock bridge that leads to the north over the canyon. This time you don't move your horse to the huge stone bridge but you ride nearly straight on to the north until you reach another natural bridge that starts with 2 huge pillars and ends in a forest. 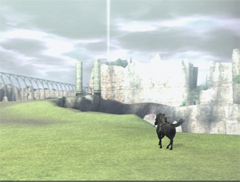 After riding into the forest keep to the stone wall to the right all the time and as soon as you see an opening in the wall turn to the right towards the opening to exit the forest again. 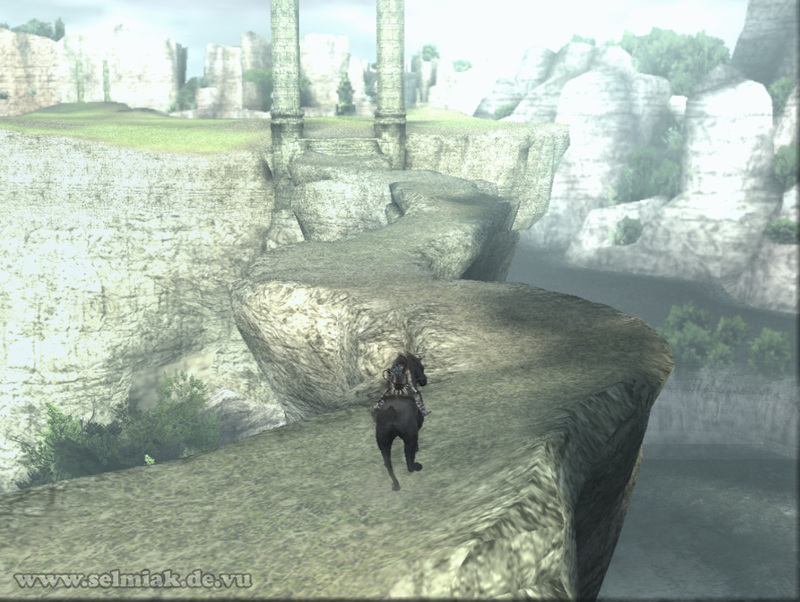 Now you trot along an unbelievably high placed cliff to finally find a beautiful and huge mountain lake with even more beautiful but also dangerously deep falling waterfalls at the end of the path. There are some big pieces of rock blocking your way to the mountain lake so climb around the pillar without falling deep down the cliff. 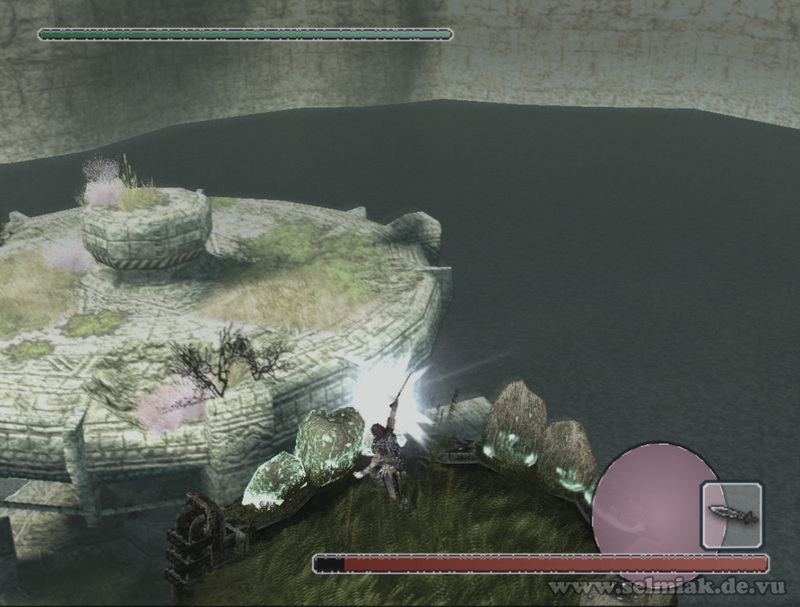 After you made it around the pillar cross the silent lake behind the pillar, pass through the two huge pillars and climb on one of the smaller islands inside the lake you will find. As soon as you step with only one toe onto one of the small island the 12th colossus will emerge from the depths of the calm lake and suddenly it's not that calm anymore. This mean guy always fires at you with his proton cannon that seems to be built into his tusks. If you are hit by this thing full on you can get hurt really bad. 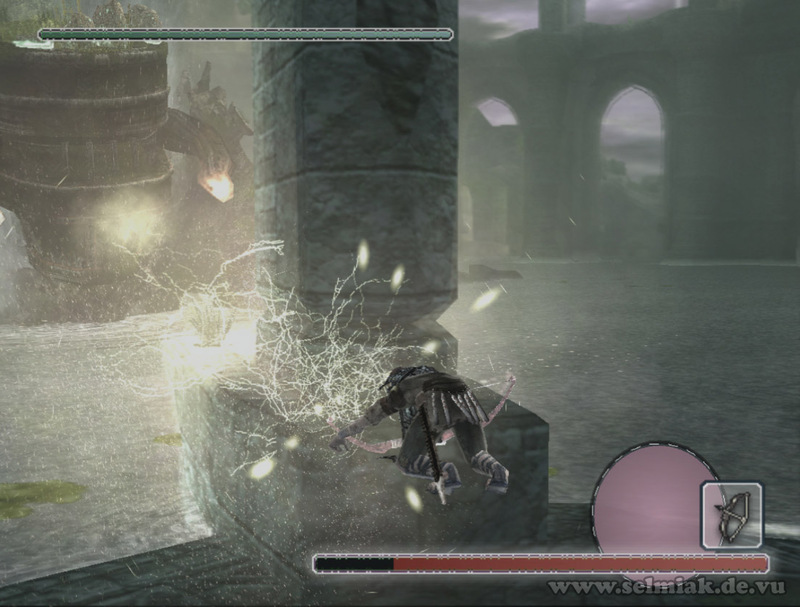 But you can avoid being hit easily. Just listen for the buzzing sizzling noise the cannon emits when it loads up for the next shot and then dive under water and continue swimming there until the 12th colossus fired his tusk proton cannon. 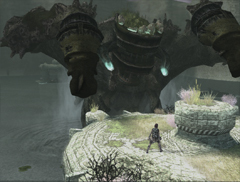 In case you are on land, which is rather seldom for this colossus fight, you should hide behind the small pillar in the middle of the island or behind one of the four support columns. While you are hiding there you can also refresh your health while just doing nothing. So this attack should be no problem for you as it is completely avoidable. So now you want to climb onto the twelfth colossus and here is the explanation how you do this with the best results. Swim to one of the three still undestroyed islands and hide behind the small pillar. Just keep calm, drink a coffee and wait until the colossus shot one shot of proton cannon in your direction and also is very close to the island. This is the perfect time to shoot two arrows onto his glowing tusks real hard. 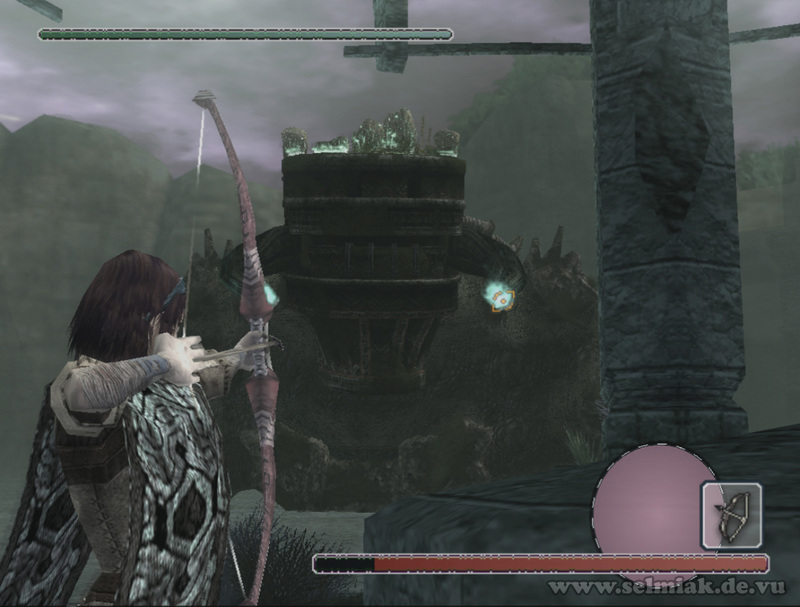 After the first arrow hit he will bow down his head and after the second hit he will bow down his head even more. Now run over the square base of the support column that is closest to the colossus towards him and jump onto the 12th colossus and get a grip on him. After he desperately tried to shake you off and (hopefully) failed doing so you can climb up on his head and look around through all the moss and grass here. But sadly there is no ornament on his head where you could strike your sword to cause some damage on the twelfth colossus, not even under all the grass and moss. But his rotten teeth that grow out of his head can be found here. 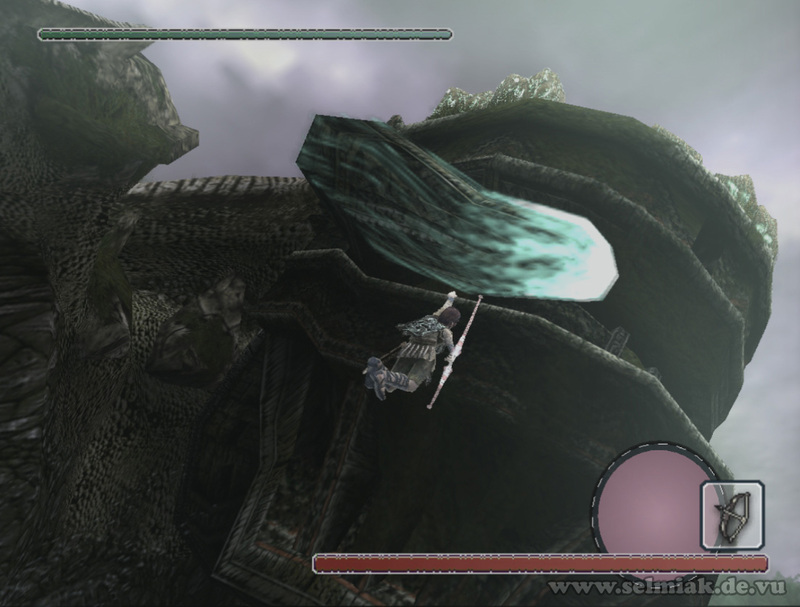 And the funny thing about this is, you can steer the colossus' movements by smashing your sword onto one of the 3 teeth rows. 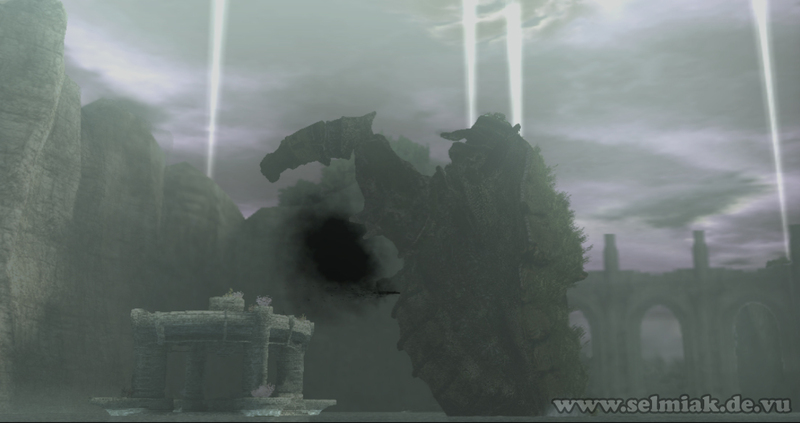 So direct the 12th colossus to one of the still intact islands in the lake and then jump onto the roof of the island temple. 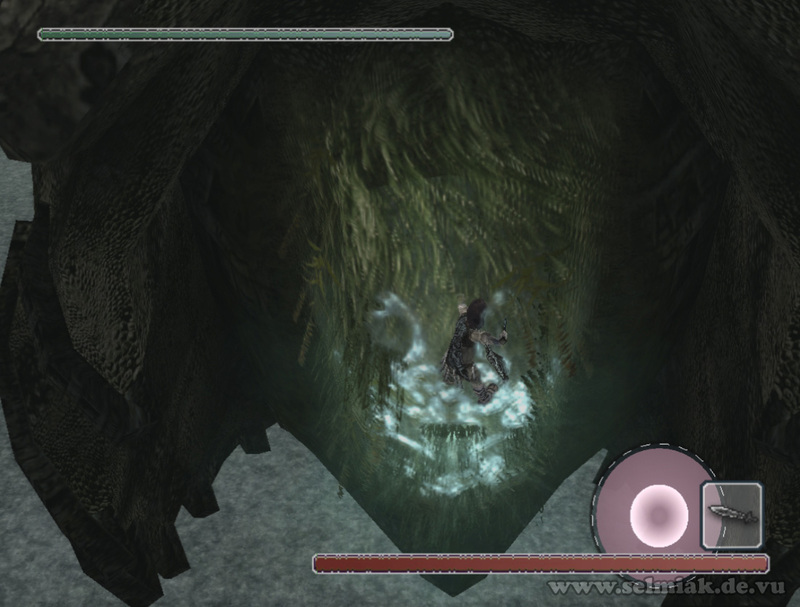 A huge jump is required here but if you managed to climb up onto this colossus you will also make this jump. Here you duck down behind the pillar in the middle again because the angry 12th colossus shoots his proton cannon at you as soon as you are on the roof. Rolling over the roof is faster than running. 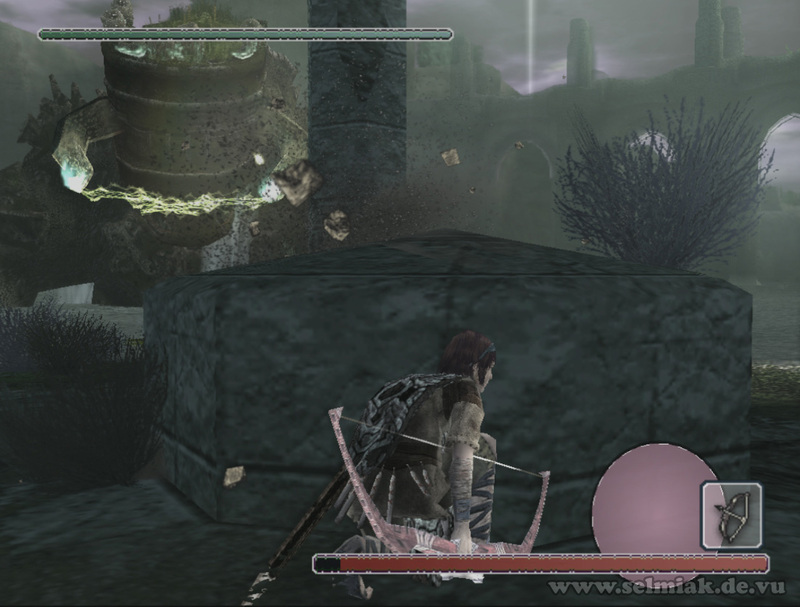 It is also possible to jump directly to the top of the temple right after climbing up on Pelagia's head. 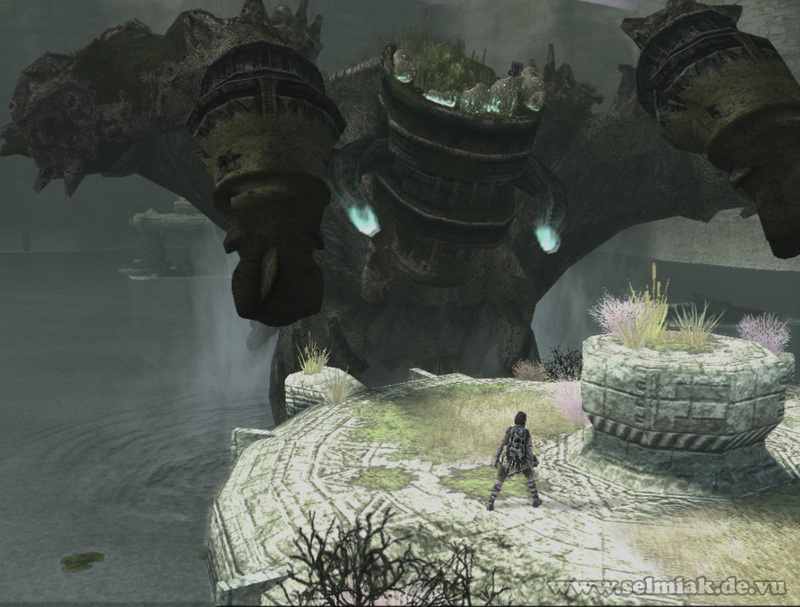 When the colossus moves his head back up just jump over and you won't have to steer him all over the place by hitting the head teeth. But this needs some very good timing (good for time attack! ), the teeth steering method above is more foolproof. Now the rhino-turtle colossus feels really great and puts his front legs onto the temple on the island you are on and shows you his hairy chest. This is the moment you've been waiting for. Run towards him and jump onto him. You will grab onto a mossy part on the belly of the twelfth colossus that was under water all the time before and there you climb down a bit until you see the glowing ornament on his belly. Don't be shy and push your sword deep into his hurt point like a maniac. After you drained 50% of his health he will let go of his island hugging stance again and drown you while doing so, but you will survive this. Then just climb up on him, then onto the temple and then jump onto his belly again just like you did the first time and get rid of the 12th colossus completely. As soon as you are on one of the temple islands don't hide behind the central pillar but behind one of the four supporting columns. 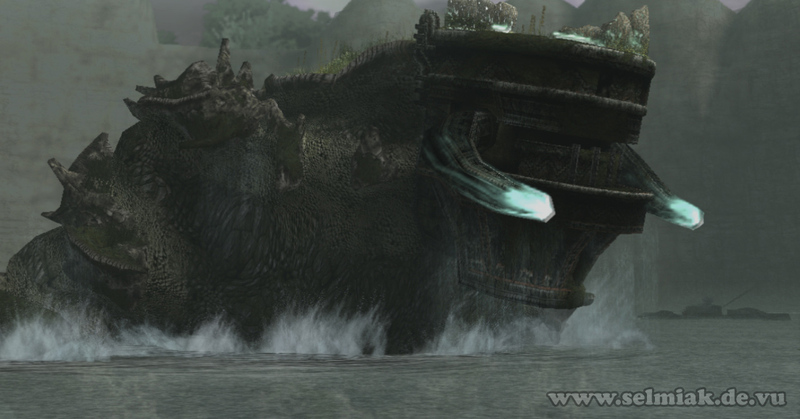 The colossus will slowly move around the temple island. While he is showing his best and back side to you run out into the lake and swim to his tail. Once you managed to grab onto his tail you can easily climb up on him towards his head. 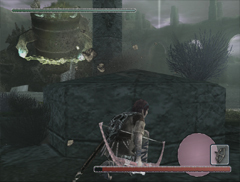 But this actually takes longer than the first method mentioned in the walkthrough above. But for the sake of completeness I wanted to mention this here. 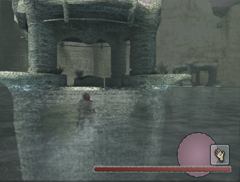 You can swim around Pelagia and climb to the head over the back. 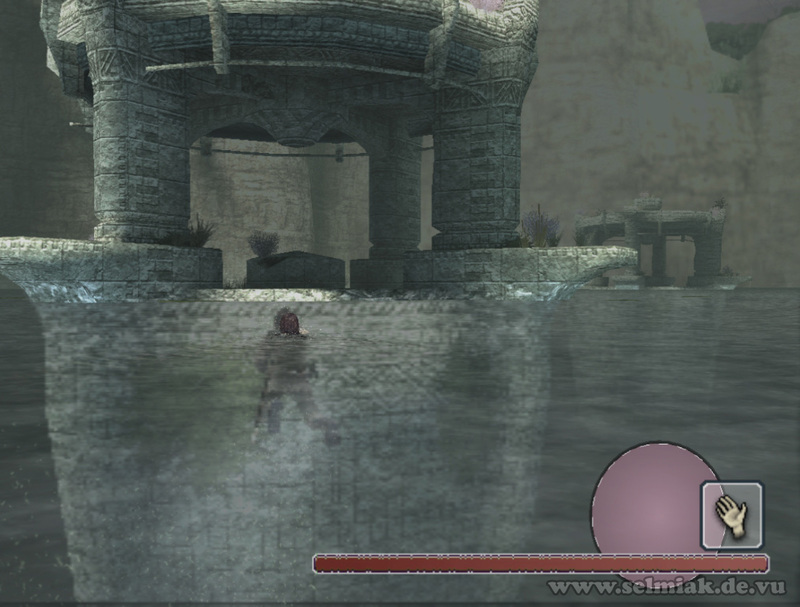 But this takes some time as the colossus turns around while you are trying to reach its back, so you want to swim underwater all the time to be faster.